From tanning on the golden beaches of the Algarve to swimming in lakes in the Serra de Estrela National Park to exploring the cobblestone streets of Lisbon and the canals of Aveiro, Portugal’s got something to suit everyone. Culture nerds, history buffs, explorers and sunseekers will all feel at home when backpacking Portugal. Often overlooked for its neighbour Spain, Portugal is definitely no longer under the radar. Make sure to put it on your bucket-list now before everyone else does! How much does a trip to Portugal cost? Portugal is blessed with pretty much year-round warmth and even its winters (November to March) still boast daily temperatures of around 16 degrees and less rainfall than other European nations. From April to October, it gets much hotter and it’s rare to see even a drop of rain. Its mild climate makes it ideal for backpacking at any time of the year but there are certain months that are better for certain activities. From May to September, the weather is at its hottest and sunniest which makes heading to the beach for a few days irresistible. To avoid too many crowds, plan your backpacking trip at the extreme ends of this period when the beaches won’t be brimming with families on their school holidays. If you’re more interested in soaking up the country’s historic, cultural and artistic sights, there’s no bad time to visit. You might find the cities more bearable when it’s not the height of summer and out of school holiday times which is when they’re typically less busy. If you want to tie your backpacking trip in with a great festival, Portugal certainly isn’t short of them. The biggest tend to fall in the summer, with music festivals like NOS Alive in Lisbon and NOS Primavera in Porto drawing in crowds with their world class headliners every June and July. Some of the best Portuguese festivals focus on food and drink, with Lisbon’s June St Anthony Festival Feast being well-known for its sardines. In February, vibrant celebrations happen all over the country for Carnival, while Porto comes alive at the beginning of June for Serralves em Festa, a three day arts festival. If it’s a chance to let your hair down that you’re craving, there’s not really a particular season for it in Portugal. Coastal party towns in the Algarve like Albufeira attract people all year round (but more so when it’s warm between April and October). Other celebratory seasons include Carnival in February and the Festival of the Saints in June that sees Lisbon’s streets host daily parties. The weather in Portugal can get quite hot in the summer, especially towards the south. Sun-seekers love this while culture vultures will probably prefer autumn or spring. The climate also varies significantly between regions. Portugal’s capital and largest city lies towards the south of the country’s central region. Although locals will start complaining about the cold when the weather’s a balmy 16 degrees, the climate is quite comfortable all year-round. In the late autumn/winter, highs sit at an average of around 18-15 degrees celsius. Not ideal beach weather, but fine for exploring the city. However, the cold isn’t the main issue, it’s the rain. It tends to be heaviest between late autumn and early spring, steadily increasing from September onwards. The rainiest months being October, November, December and January. However, there can be periods of good weather can last into October and even early November, a phenomenon known as “St. Martin’s Summer”. In the actual summer, from June to August, weeks can go by without a drop of rain. Perfect for catching the train out to the beach. When the sun’s out the city comes alive with many events taking place outdoors. The city is full of outdoor terraces and people relaxing in the sun at miradouros (viewpoints). However, as the tourists pour in, things get a bit crowded. Temperatures in June are in the early to mid 20s, and can soar into the 30s in August. If you like things a bit cooler think about heading in May or early September. Also bear in mind that in August, a lot of Portuguese people take their holidays, causing many restaurants and bars to close. The beautiful sandy beaches and azure blue seas of the Algarve make it a great spot for a relaxed seaside holiday. In fact, each year the region gets more sun than California. Again, the ideal time to visit will depend on how well you can tolerate heat: summer temperatures, while averaging in the mid to late 20s, can soar to over 30 in July and August, with rain in these months being almost non-existent. However, it’s worth bearing in mind that things can get a bit crowded at this time of year, especially in August, with a lot of Portuguese people heading to the region to spend their holidays. If you think the summer temperatures would be a bit to much for you, it’s a good idea to visit in May, September or early October, when highs will be around the mid 20s. Bear in mind however, that there’s still a small possibility of a shower or two. And although temperatures are pretty comfortable all year, you might not get ideal beach weather in winter, when there’s a big risk of rain, peaking at 96mm in December. Unlike Lisbon and Porto, which can get a bit breezy, winds in the Algarve are generally quite gentle, with the region being sheltered from the Atlantic wind. In comparison to Lisbon and the south, the weather in Porto (and the north of Portugal more generally) is a bit cooler and wetter, particularly during winter. Rainfall can get as high as 120mm in December (compared to 96mm in the Algarve and 80mm in Lisbon). Because of the effects of the Atlantic, things can get a bit stormy, with strong winds. Temperatures are at their lowest in January (at around 13 degrees) and are a couple of degrees cooler than Lisbon or the Algarve). Much like the rest of the country, the wettest period is from November until March. Despite all this, the climate in Porto is quite pleasant, especially if you’re used to the weather in the UK or Ireland. From May onwards, temperatures rise above 20, peaking at average highs of around 25 in August. Warm, but still comfortable for walking around. This makes Porto’s weather great for those who enjoy the sun, but don’t like intensely hot weather. In hotter periods the temperatures range from the mid-twenties to around thirty, perfect if you want to pop to the nearby coast for a surf. If you’d prefer things a little bit cooler, head in May or early Autumn- the weather is mild, with highs of between around twenty to twenty five degrees. But be warned, you may get the occasionally wet day. Portugal is part of the Schengen Common Travel Area. This means that if you’re in this zone, you can pass into any other Schengen countries* freely, without having to go through border checks. The UK and Ireland aren’t part of Schengen, so if you’re departing from there, this won’t apply. However, if you’re an EU citizen all you have to do is show your passport and you’ll be waved through at the border. If you’re an Australian or US citizen things will be a little bit more complicated, but don’t fret! As mentioned above, if you’re already in a Schengen country you’ll be able to pop across the border without any checks. Bear in mind, however, that in emergency situations border checks may be reinstated. For this reason, it’s probably a good idea to have your passport on you when you’re crossing a border. You can find regularly updated info at the European Comission website. Travelling from outside the Schengen zone is also pretty easy for US and Australian citizens. If you’re planning on staying within Schengen countries for less than 90 days, you won’t even need a visa, just a valid passport**. Once this time is up, you will have to stay out of it for 180 days or more before being allowed back in. EU citizens who have been in Portugal for 3 months need to register at the local town hall. **If you’re a US citizen your passport needs to be valid for at least three months from your planned date of return. If you’re an Australian, your passport should be valid for at least six months from your planned date of return. Portugal may be small (it takes about five hours to drive from Faro along the southern coast to Porto up in the north), but it’s packed full of picturesque towns and could easily win the award for the most stunning coastline in Europe. Since you’ll want to spend your time getting lost in ancient city centers or basking in the sun, here are a few tips to make it easier to get from place to place within Portugal. You can easily get around Portugal using the public train system, Comboios de Portugal. There are four types of services, going from cheapest to most expensive: Regional (R) trains make the most stops, Interregional (IR) are a bit faster, and Intercidade (IC) are Rápido or express trains. The Alfa Pendular Deluxe (AP) service is the fastest and the most expensive. When you go to book a ticket, the service will be noted by the abbreviation. The journey on an IC train between Lisbon and Porto costs around €25 and takes about three hours, though there are special advance deals for as cheap as €10. While plane tickets between Lisbon and Porto may be close in price, the train may actually end up saving you time because you don’t have to travel outside the city center to the airport or worry about getting through security. As an added bonus, a number of Portugal’s train stations feature exceptional architecture and artwork. Don’t miss Lisbon’s modern Gare do Oriente with its metal and glass lattice covering, and São Bento in Porto, covered in traditional azulejo panels and often touted as the most beautiful train station in the world. IC trains between Lisbon and Faro are around €21 and also take around three hours. Special deals (usually booked at least 8 days before travel) are around €10. Mainland Portugal’s compact size may be more suited to train travel, but you’ll need to catch a flight if you want to visit its islands. It is almost a two-hour flight from Lisbon to Madeira, and about two and a half hours to São Miguel, the largest island in the Azores archipelago. TAP Air Portugal, Ryanair and easyJet all make regular flights to the islands from Lisbon. Buses are another convenient way to travel through Portugal. Rede Expressos is the national network of buses, supplemented by local and regional bus companies. Expressos, the express coaches between major cities, are typically cheaper and a bit slower compared to the trains, but usually not by much. For example, a ticket between Lisbon and Porto costs € 19 and takes about three and a half hours. Lisbon to Faro costs € 18.50 with a journey time of around four hours. The bus routes are fairly wide reaching, so they’re great if you want to go beyond the common day trips from Lisbon or Porto, or for getting around the Algarve’s popular resort towns. Renting a car provides the most flexibility if you want to explore outside the bigger cities (I wouldn’t recommend driving in Lisbon or Porto), go deep into the countryside or enjoy the Algarve’s more remote beaches along Portugal’s western coast. Rental prices peak in the summer months (June, July and August), so book early or go off-season to find the best deals. If you’re renting for more than a few days, look for a weekly rate as it may be lower, and plan to go round trip as dropping off at a different location always means extra fees. Plus, don’t forget to have spare coins for the toll roads. One of the things I love about Lisbon is that it’s incredibly walkable, so often the best mode of transportation is your own two feet. If you get tired of traipsing up and down the city’s seven hills, there are even a few funiculars and elevators, or ascensores, to help you get up the steepest ones. If you plan to venture a little further, never fear, because the ways to get around are almost endless. The most convenient and cheapest way to pay for Lisbon’s public transit is to purchase a reusable Viva Viagem card (€ 0,50 for the card) at almost any train or metro station and load it with euros so you can use the “zapping” method. This pay-as-you-go method works for Lisbon’s historic yellow trams, buses and metro around the city, and even the train network to places like Cascais and Sintra. If you want to use taxis to get around Lisbon, most are cream colored with the taxi signs on top. Taxis are less expensive than most other Western European capitals, but Uber is typically cheaper. If you want to catch an Uber from the airport into the city, the pickup is from the car rental area and costs about € 15 to get to the downtown area. Portugal is great for a backpacker budget with affordable food, accommodation and travel costs. Compared to other countries in Europe, you will probably see your money go further in Portugal. Supporting local businesses and avoiding tourist traps is a great way of contributing to the local community but is also the best way to stay on a budget. As with most of the countries in the European Union, Portugal’s currency is the Euro. Compared to other European capitals, Lisbon is really affordable and great for a backpacker’s budget. Flying in or out of Portugal is relatively affordable from other major European cities with regular flights from most destinations. Lisbon, Porto and Faro have the most direct routes. If you are flying in from outside of Europe, you may need to stop first at a larger hub like London, Barcelona or Paris and then fly onto Portugal. If you are travelling to Portugal from Spain or France via train or coach you may find prices to be as expensive as flights and take far longer. At a local cafe 2.50 euros will get you a pastry and coffee. Bargain! In a touristy place, prices will be much higher. Look for small, family run spots with signs in Portuguese to have a more authentic local experience. They may look less modern than other places but we promise you, you’ll get the best food, it’ll be better for your wallet and you’ll be supporting the local community. You can get some great value dinners for 15 to 20 euros and lunches are between 5 and 10 euros. Shopping for groceries and cooking in your hostel is a great way to save money. You can shop for a week’s worth of food for about 30 to 40 euros. Most events and activities are fairly cheap with entrance costs often between 6 and 15 euros. Much of Portugal’s best attractions are free – the scenery, the lively atmosphere and the stunning architecture. Lisbon has a vibrant local music, art and cultural scene. You’ll come across a huge range of gigs, theatre and artistic exhibitions hosted by the local community, usually for only a small fee. Taking part in local community activities like this will give you a really authentic experience that’s much cheaper. If you decide to make Lisbon your base for an extended period of time, you can expect to pay 300-450 euros for a room in a shared house or 500-700 for a one-bedroom apartment. A monthly ticket for any kind of public transportation will cost about 36.20 euros per month, and you can expect to spend between 300-450 euros per month on entertainment and food. In Porto, a room in a shared house will cost between 200 and 300 euros, and you can find one-bedroom apartments for as little as 450 euros. The transportation fares in Porto depend on the zones you travel between, but start at 30.30 euros a month; you can expect to spend between 500-600 euros on your monthly expenses, including rent. Portugal has plenty of affordable accommodation with great facilities in fantastic locations. Hostels are a great option and a fantastic way to meet new people, offering events such as pub crawls, dinners and city tours. Many have bars and terraces where you can kick back and soak up the Portuguese sun, bike rentals for exploring the surrounds and surfboard rentals when you’re staying near the coast. One of the great things about staying in hostels is the chance to meet like-minded travellers and friendly staff. In Portugal, hostels are often run by locals, with friendly staff who want to show you their local area. Hostels also support the local community as holiday lets have been responsible for driving up rents and pushing locals out of many inner-city areas, particularly in Lisbon. Lisbon has really electric neighbourhoods that can be great for partying (Bairro Alto), perfect for history (Mouraria) or ideal for creatives (Intendente). Choose a neighbourhood to stay in based on your holiday vibe. Lisbon is also home to some of the most luxe hostels around, that feel more like boutique hotels than hostels. So if you’ve been travelling for a while and just need a bit of TLC, Lisbon hostels have great amenities, beautiful decor and affordable private rooms and bathrooms. There is a wide network of hostels in Portugal with lots of options in popular destinations such as Porto, The Algarve, central Portugal, Lisbon, Madeira Island and Açores. Check out our guide to hostels throughout Portugal to plan your perfect trip. One of the easiest ways to backpack through Portugal is to simply start at the top of the country and work your way down. Begin in historic Porto and then use the country’s other main cities to navigate, stopping off at stunning beaches, quaint towns and impressive natural parks for a breather in between sightseeing and soaking up the local culture. While not as lively as Portugal’s other cities, Porto is packed with charm thanks to its centuries of history that are reflected in both its gorgeous architecture and range of attractions. Don’t miss climbing to the top of 18th century Clérigos Church’s bell tower for panoramic sunset views or spending an hour pottering around Livaria Lello, an incredible bookshop with Neo-Gothic interiors and a magnificent sweeping staircase. If you like modern art, Serralves Museum near the city’s seafront always has a great exhibition on that’s free to enter if you’re visiting on the first Sunday of the month. As the city’s name suggests too, it’s the home of Port and also sits within the country’s Douro Valley wine region, meaning there’s plenty of opportunities for tastings if that’s your kind of thing. The Vila Nova de Gaia area along the river is famous for its port wine houses that are the best places to try Port, either as part of a tasting session or in a refreshing cocktail sat on a terrace in the sun (Graham’s has a particularly good bar with views across the water). You’d be forgiven for thinking you’d suddenly ended up in Venice in this picturesque city perched on the Ria de Aveiro lagoon. Just like the watery Italian city, Alveiro too is made up of canals that are traversed by brightly coloured Moliceiro boats that you can pay to ride on. It’s primarily a quiet university city but it’s well worth a visit if you’re a fan of colourful architecture and art. The pretty pastel Art Nouveau style buildings along the water in the Rossio neighbourhood make the perfect backdrop for photos, while picturesque Mosteiro de Jesus monastery that houses the local museum is the town’s main attraction. Aveiro is around 70km south of Porto and can actually be visited on a day trip if you’re short on time. If you’re arriving by train, don’t forget to take a look around the gorgeous old station with its blue and white tiling that’s located next door to the newer terminal. There are also free bikes (known as BUGAs) to borrow courtesy of the local council if you don’t fancy being on your feet all day. Coimbra is only a short hop on the train from Aveiro and offers the perfect balance of ancient and contemporary Portuguese culture. It was once the capital of Portugal and is consequently full of wonderful Medieval buildings and historic attractions including a hillside royal palace that has been home to the University of Coimbra for centuries. Its picturesque campus is free to visit (except for the stunning 18th century library) or you can go on a guided tour for under €20. Culture aside, Coimbra is predominantly a student town and you’ll find plenty to entertain you here come nightfall. There’s no lack of bars in the city and a fair few of them are situated around Sé Velha Cathedral. Fangas Mercearia is housed in a former food market and serves up drinks along with light bites (including plenty of veggie options), while the Bigorn Bar is a real student haunt that offers cheap drinks and the chance to mingle with locals and other travellers. If you have the chance, take a trip to the Fado Centre too to listen to some of Portugal’s traditional music. If you’re able to hire a car or are doing a road trip tour of Portugal, taking a day or so to explore the Serra de Estrela National Park is well worth it. It’s a two-hour drive from Coimbra and known for being the highest mountain range in the country as well as the only place you can go skiing. Climbing mountains, horse trekking, mountain biking and swimming in melted glaciers are just some of the other activities on offer. A surfer’s paradise, Peniche is a coastal city just north of Lisbon. It might seem like you’re backtracking but unless you have a car, the easiest way to reach it is by coach from Lisbon. The journey takes just under two hours and you can take a Sete Rios or a Campo Grande bus. Once you’re in Peniche, you’ll find it’s a real gem when it comes to dramatic coastal scenery thanks to its unique position on a rocky headland. A 10km ferry ride from Peniche is Ilhas Berlengas, a beautiful nature reserve made up of three islands that’s perfect for bird spotting, idyllic walks or diving if you have money to spare. It’s only regularly accessible from the mainland from May to October and there’s a limit as to how many people are allowed to visit it each day, meaning it’s never too crowded. Peniche’s Baleal beach is a great place to spend a day on the sand as it’s fairly sheltered and has a few surf schools to choose from (with lessons starting at around €30). If you’re a more seasoned surfer, Medão Grande Beach (known locally as Supertubos) and Lagido Beach boast great waves and often host international surfing competitions. Beyond the beach, Peniche’s imposing 16th century fortress is home to a great museum, while nearby are plenty of decent restaurants where you can enjoy some fresh seafood. While you could spend a whole month here and never run out of things to do, eat and see, a few days is just about sufficient to get a taste of the vibrant Portuguese capital. With its melting pot of different architectural eras and influences, Lisbon’s skyline is truly unique and best viewed from the top of Elevador de Santa Justa, a 19th century lift in the Santa Justa neighbourhood. Art lovers will enjoy spending an afternoon exploring the bohemian and hilly neighbourhood of Bairro Alto that’s known for its narrow streets, bright yellow 1950s trams and its mish-mash of shabby-chic bars, restaurants and boutiques. It’s also got plenty of hostels and hotels to choose from, making it the perfect place to base yourself. History buffs shouldn’t pass up the chance to get lost in São Jorge Castle and its beautiful gardens. The Belem neighbourhood to the west of the city centre is also worth a few hours exploring to see its two most famous attractions: the impressive Torre de Belém, a 16th century defense fortress that juts dramatically out of the sea, and Pastéis de Belém bakery, the home of the Portuguese custard tart. A few days of sunning, swimming and sipping on cocktails is a sublime way to finish off a backpacking tour of Portugal. A short internal flight away from Lisbon is the popular Algarve region that’s essentially a long stretch of coastline made up of fishing villages, idyllic coves and resort towns. Temperatures can soar in the Algarve region but you can expect a dip in the sea to be a little more than just refreshing as it’s the icy Atlantic Ocean that you’ll be plunging into! Albufeira is the town of choice if you’re after a few days of non-stop partying with a younger crowd. For something more relaxed though, Lagos is a good shout as it not only has stunning beaches and plenty of entertainment and dining options but also a historic walled old town filled with pretty piazzas and quaint streets. If you’d prefer to go off the beaten track, hire a car for the day and take a road trip down the coast to find a secluded cove or slice of empty beach. Camping on the white sands of Tavira Island (an hour’s drive from Lagos) is also an affordable yet memorable way to spend a night or two away from the hubbub of the more popular towns. Once you’re all beached out, you can fly home from the region’s capital Faro or extend your trip into neighbouring Spain via plane, train or car as the border is a mere 40 minutes away. If you’ve got time to spare after your initial two-week exploration of Portugal, it’s well worth hopping on a plane and travelling to the Azores that are some 900km west of the mainland. Paradise for nature lovers and highly eco-friendly thanks to their miles of protected land, they’re a far-flung group of islands that are relatively unknown yet utterly breathtaking. Visits to the Azores tend to be action packed, with hiking, whale-watching, canyoning and diving being among the list of adrenaline-rushing activities up for grabs. If you’re not familiar with Portugal’s food, the first thing you need to know is that their culinary creations are a real mix when it comes to flavour. As it was once one of the biggest trading nations in the world, exotic spices and unusual ingredients sit side by side with typically Mediterranean produce to create a really diverse and truly delicious cuisine that definitely deserves more recognition. For a country with hundreds of miles of coastline, it shouldn’t come as too much of a surprise to learn that Portuguese gastronomy is jam-packed with tasty fresh fish and seafood. In fact, they’re one of the biggest consumers of it in Europe, with locals munching down on anything from cod through to juicy prawns on a daily basis. Some of the country’s most authentic fare also has strong roots in rustic peasant cooking, from hearty veg and sausage stews to fresh sardines served with rice, salad or potatoes. You’ll find that the majority of dishes are accompanied by this trio of simple sides, and that every region will have their own speciality main courses that range from grilled sardines in the south to spit roast pork or wild boar in more rural, central regions. If you visit at certain times of year, there are some seasonal specialities that you should try as well. As winter approaches up you’ll see plumes of smoke rise up from little stalls selling roasted chestnuts. Visit around Christmas and the bakeries will be full of colourful “Bolo Rei” (King’s Cake) – stuffed with raisins and topped with crystallised fruit. It’s quite similar to panacotta. In summer you’ll be sure to find street vendors selling fresh figs and cherries and in June, during the festivals of the popular saints, you’ll be treated to the sights and smells of people barbecuing fresh sardines in the street. When it comes to traditional Portuguese dining, it doesn’t get more authentic than a traditional tasca. If you take the time to look for one you’ll be greeted with a cheap and cheerful tavern full of little metal tables and chairs, pushed close together and rewarded with hearty, homemade food. Opening hours are usually between 12:30-2:30 for lunch and around 7-10:30pm for dinner. Be careful not to fall into expensive tourist traps that are often fitted out with fancy furniture and advertise themselves with English phrases such as “Traditional Portuguese Cuisine”. Price is a good indicator of a local venue. Tascas are almost always cheaper. Expect to pay around €1-2.50 for a glass of wine and the same for a small beer. Meat dishes should set you back around €5-8 and seafood around €6-9. Local spots can also often be found by their list of “Pratos do Dia” (dishes of the day) taped to the window, sometimes scrawled onto a paper tablecloth. Meals in Portugal are by no means speedy affairs, and you may find yourself waiting a while for the chef to prepare your food as it’s almost always made from scratch. As with many restaurants in European countries, the bread, butter and olives served at your table aren’t usually free and will be added to your bill at the end of a meal. Freshly-grilled sea bream (dourada), sea bass (robalo), or swordfish (peixe-espada) with salad are all great authentic options. For the more adventurous eaters, there’s plenty of octopus (polvo) and squid (lula) on the menu, as well as specialities such as goose barnacles (percebes) and razor clams (ligerão). Try arroz marisco (rice with seafood) or arroz de polvo (rice with octopus). And, if you’re a fan of calamari, you have to try the choco frito (deep-fried cuttlefish). Meat dishes are quite rich and hearty in comparison to other countries in southern Europe. It doesn’t get much better than a bitoque: steak cooked in wine and garlic served up with freshly-cut chips and a fried egg. Carne de Porco à Portuguesa is the same, except with pork instead of steak and without a fried-egg. Add clams and you’ve got Carne de Porco à Alentejana. Look out for delicious cuts of meat such as steak picanha and secretos de porco preto – literally “secrets of pork from black pigs”. Alheira is another local speciality – a mixture of sausage meat and breadcrumbs, served with a fried egg and chips. Tostas (toasted sandwiches) are a great cheap eat. The most common is tosta mista (cheese and ham). The king of the tostas is the glorious francesinha, a delicacy originating in Porto. It consists of toasted bread, pork, sausage and bacon topped with cheese sauce and served in a dish full of delicious beer and tomato sauce. Another classic Portuguese sandwich is the bifana, a slice of pork in crusty bread. Other light-bites you should try are caldo verde (cabbage soup) and sopa de feijão (bean soup). When you’re in Portugal, you’ll be sure to stumble across traditional little bakeries serving empadas (small pies filled with everything from cod to cheese and spinach), pataniscas (cod cakes) and folhadas (Portugal’s answer to the Cornish pasty). Although meat and seafood play a big part in Portuguese cuisine there are still options for vegans and vegetarians. Lisbon has many great Nepalese restaurants with excellent options for vegans and vegetarians. Os Tibetanos in Lisbon serves up Tibetan food in a space formerly occupied by Buddhist monks. Food Temple is also a great option serving up tasty vegan tapas. In Lisbon and Porto, there’s also the option of visiting a “cultural association”. These non-profit community organisations serve cheap, tasty vegetarian and vegan food for around 3 euros a dish. If you’re wondering where to look, try asking someone at your hostel who lives locally to put you in the right direction. If you do visit, remember these organisations are run by volunteers for the community and while they’ll welcome anyone, won’t appreciate loud crowds of boisterous tourists. Have a sweet tooth? Then you’re in luck! Chocolate fans will love the brigadeiro – a melt-in-the-mouth treat made of chocolate, condensed milk and butter. Pão de Deus is a heavenly sweet bread roll soaked with coconut icing, which literally translates to “bread of God”. You should also try Bola de bolacha, a cake made from several layers of biscuits sandwiched together with cream. The Portuguese are also particularly fond of their espresso which you can usually pick up in a café or restaurant for under a euro. For something a bit sweeter try a galão, which is made with lots of milk and foam, or a meio de leite (slightly stronger, with half milk, half coffee). My personal favourite is the pingado (espresso with just a drop of milk) or café cheio (espresso with the cup filled up to the top). From sophisticated cocktails to local wine, it’s possible to get any drink under the sun and for a decent price in Portugal. Portugal has a long history of winemaking and produces some of the best wine in the world with a robust, full-bodied flavour. Douro is the most established wine producing region. Alentejo and the Setúbal peninsula also produce beautiful wine. There is the also the well-known vinho verde or “green wine”, named after its young age rather than colour, with a relatively low alcohol content. It’s also crisp, refreshing and slightly sparkling, perfect for a warm summer’s day. Port wine is probably Portugal’s most famous export. At around 18% it’s deceptively sweet, made from fortifying Douro wine with brandy. Although originally produced only with red wine, you can now find white varieties as well. If you’re in Porto, why not visit one of the many Port wine cellars in Vila Nova da Gaia, and enjoy a glass or two while you’re at it. There’s been a boom in craft breweries in the last few years in Portugal as well. Lisbon’s Marvila district is full of great brewpubs, and you can find their beers (such as Dois Corvos and Musa) in cafés and bars around the city. One of the most notable breweries in the city is AMO, a tiny establishment run by Margaret Orlowski, offering a great range of beers opening its doors to a friendly crowd of expats and locals on Thursday and Friday evenings. If you’re more of a cocktail or spirit drinker, you’ll find the ocean side bars near Lagos and the beach clubs just outside of Lisbon have the largest variety. Portugal also has a few locally produced liqueurs like cherry flavoured Ginja de Óbidos as well as orange and chestnut varieties that are served as aperitifs in restaurants as well as sold in shops (they make excellent souvenirs!). The cost of drinking is much cheaper than in count too, with pints often priced at €1.50-€2.00 and a bottle of wine starting at around €6. Make it your mission to try most if not all of these native delicacies! With their melt-in-the-mouth layered pastry and their cinnamon dusted custard filling, pastel de natas are an absolute must-try. 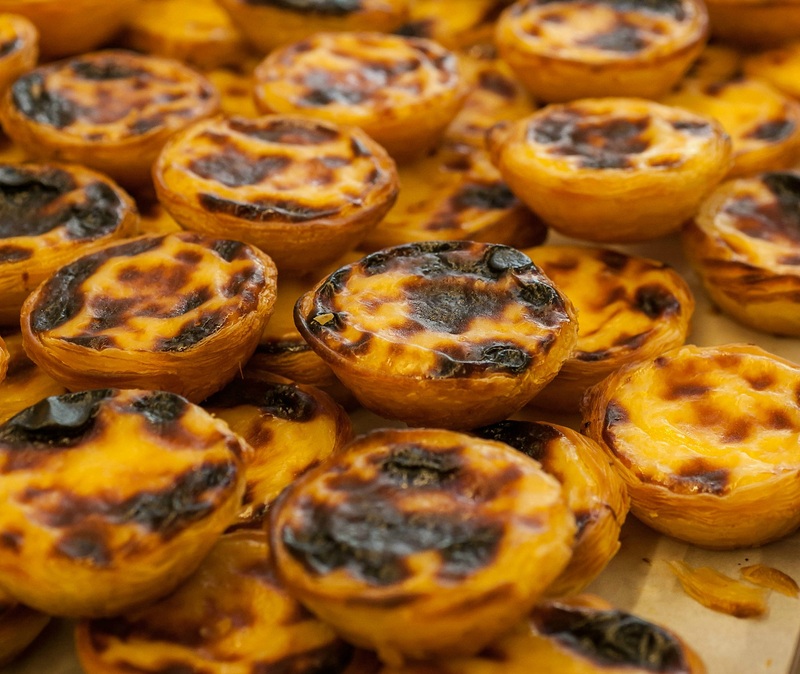 The best place to find these tasty morsels is in Lisbon, with Pastéis de Belém not far from Belém Tower being the best known and one of the oldest pastelarias (patisseries) in the city. There’s plenty of other places to try them that are less touristy including Manteigaria in Chiado, where you can also watch the pastry chefs make them, and award-winning Pastelaris Cristal in Lapa that’s a favourite haunt of locals. Largely thought of as the country’s national dish, bacalhau is salted cod that can be served in a myriad of ways, from mashed up in fishcakes to baked in the oven with cream and potatoes. Despite Portugal’s waters being full of fish, bacalhau is actually not native to the area and was first brought over from the cold waters of Scandinavia during the time of the Vikings. Almost every local restaurant will serve it though, often in their own unique way, but the most popular dish is definitely bacalhau à brás which is when it’s shredded and cooked with eggs and potatoes. In Portugal you get the real deal when it comes to peri-peri! From chicken to prawns, you’ll see this much-loved spice in a lot of restaurants. Named frango no churrasco in the local lingo, peri-peri chicken is the most widely available option and there are so many places to get it in Lisbon in particular. Bonjardim, just a couple of minutes from Restauradores Metro stop, is one of the most famous places to try it and it boasts cheap prices (just over €5 for a whole chicken) and street side seating so you can people watch as you eat. Perfect for a quick lunch, a bifana is essentially a sandwich stuffed with thinly sliced pork that’s been infused with spices and garlic. They’re largely considered street food so you’re more likely to find them in a café or stall than a restaurant. At only €2-€5, you can’t really go wrong with a bifana and they’re ideal to eat on the go if you want to spend more time seeing the sights. If you’ve got some cash to splash on a fancier meal, don’t miss this authentic dish that consists of fresh clams typically drenched in a sauce made up of olive oil, garlic, coriander and lemon juice. Usually found in most restaurants along the coast (especially in the Algarve region where the clams are normally sourced), it’s also a staple of Lisbon’s cuisine. Portuguese white wine is the best drink to pair with amêijoas and some places will even pour a dash in the pot when they’re cooking. If you’re a real foodie, Porto should definitely be on your backpacking itinerary as it’s informally known as Portugal’s food capital. One of its specialities is francesinha which is similar to a bifana in that it’s a sandwich packed with juicy, delicious smoked meat. Unlike a bifana though, it’s served open and comes topped with a fried egg, melted cheese and an unusual yet rich beer infused sauce. Although it is rapidly becoming more modern, until recently Portugal was still quite a rural country, which was quite late to industrialise. As a result of this, traditions are still prized and the church retains a prominent place in society, especially in contrast to northern Europe. Over the years the country has been occupied by the Romans, French and its neighbours in Spain and North Africa. The legacy of the Moors can still be prominently seen in architecture throughout the country. Beautiful examples include Lisbon’s Castle of St. George and Sintra’s Moorish Castle. Many Portuguese people remain proud of their country’s role in the “age of discovery”, when Portugal discovered and colonised the islands of Madeira and the Azores in the 15th century. Later, Portuguese navigators such as Vasco da Gama and Fernando Magalhães (Ferdinand Magellan) became the first men to sail to India and circumnavigate the globe. As a result of this exploration, Portugal was briefly the world’s richest nation. Portugal is a young democracy. Between 1926 and 1974, it was ruled by a regime under which political parties, trade unions and strikes were banned. Those who dared to speak out were brutally oppressed by the secret police. It was eventually overthrown by a faction of the army, who on 25th April 1974, stormed Lisbon in a relatively bloodless coup. The jubilant population put red carnations in the soldiers’ rifles, in what would later become known as the “Carnation Revolution”. April 24th is the date the Portuguese democracy is celebrated with concerts and festivities. In Lisbon, celebrations are held at Praça do Comércio, the city’s main square and in Porto, the main celebrations are held on Avenida dos Aliados. In addition to this, many cities across Portugal see protest marches on the 25th April, as well as commemorative exhibitions and talks. Other festivals in Portugal centre around religion, most notably the Festas dos Santos Populares in June. This celebrates Saint Anthony, Saint John and Saint Peter. Community groups in towns, cities and villages get together to decorate houses with bunting and lights. They’ll also set up arriais little stalls selling beer, wine, bifana (pork sandwiches) and freshly grilled sardines. Celebrations in some towns may focus on one saint in particular. In Lisbon it is Saint Anthony. A parade will follow Avenida da Liberdade, with groups of musicians and dancers representing each district competing against one-another. Walk through one of the historic districts of Lisbon (Bica, Alfama, Graça and Mouraria) on the night of the 12th June and you’ll find the streets full of people singing and dancing to Pimba music – a cheesy mix of pop and Portuguese folk. You’ll get a similar experience in Porto on the night of 23rd June, when the city celebrates Saint John. The old centre of the city, running from São Bento station to Cais da Ribeira will be decorated in bunting, the streets will be full of barbecues, stalls selling beer and musicians. Go down to the river at midnight to see the firework display, then head to the beach of Praia dos Ingleses for bonfires and more celebrations. If you’re not feeling too under the weather the next day, head down to the river to see the Regata dos Barcos Rabelos, a procession of traditional boats that used to transport wine down the river from the vineyards of the Douro valley. There are also dozens of music festivals in the spring and summer such as Rock in Rio, NOS Alive and the Lisboa Dance Festival in Lisbon, as well as NOS Primavera Sound in Porto. For jazz fans Outjazz in Lisbon runs from May to September and the Porto Blues Festival occurs in May. For a taste of traditional Portuguese music check out some Fado music in Lisbon or Coimbra. It’s a beautiful, emotional style of music originating in the poorer areas of 19th century Lisbon. The original Fado singers were themselves poor and from marginalised groups in society. Its melancholic style reflects this, with themes of daily life, love, loss, luck, and saudade – a feeling of yearning for something lost. The best places to hear it are at small bars and cafés, where you can sit with a glass of wine and soak in the atmosphere. I lived in Lisbon for a year and a half and my everyday experiences with Portuguese people are that they are friendly and eager to chat with me. I always felt quite safe when walking around at night. I did, however, hear numerous stories about pickpocketing, especially during high-season when the streets are full of tourists. While levels of violent crime are quite low, petty crime does occur. Keep your belongings close at hand when you’re travelling on crowded trams or buses, or when making your way through busy city squares. Thieves are also known to target rental cars and those with foreign license plates. Always keep your doors locked and park in secure locations wherever possible. Be aware of scams selling fake tickets to attractions, particularly in Belem in Lisbon. Only use official vendors. It is not very common to tip in Portugal, especially in more casual restaurants. Keep in mind that many restaurants charge for any starters they put on your table, even if you did not order them, so always ask if they are offering olives and bread or if these will be charged. The cheapest times to visit Portugal are between March and May or September and October. It’s also better to visit outside of holidays such as Easter and Christmas if you’re on a budget – however these times have some of the greatest celebrations to experience. Eating is taken quite seriously by the Portuguese. They always find time to enjoy good food with family and friends regardless of their busy schedules. Start your day in a traditional bakery with a Pão de Deus or a Tosta and espresso; and if you feel like you want the full pastry experience, order another espresso and enjoy it with a Pastel de Nata. For lunch, go lighter and enjoy a fresh sandwich with caldo verde and fresh orange juice. The night is the time to enjoy a full meal with wine or beer in a traditional tasca. David Irvine is a translator, as well as an occasional scribbler, waffler and jazz music enthusiast. Originally from Northern Ireland, he’s got a passion for languages and other cultures, having previously lived in Germany and Portugal. Jemima is a full time travel writer and a part time explorer. She’s also a lover of tea, dogs and good books. Laura Carniel is Hostelworld’s Brazilian Content Executive and has also lived in Lisbon.